The city of Thun with a population of approx. 45,000 is the gateway to the Bernese Oberland. Especially in the city centre there are traffic problems due to intensive parking search traffic. In order to tackle this problem, SWARCO designed a flexible parking and traffic control system that is ready for future extensions. 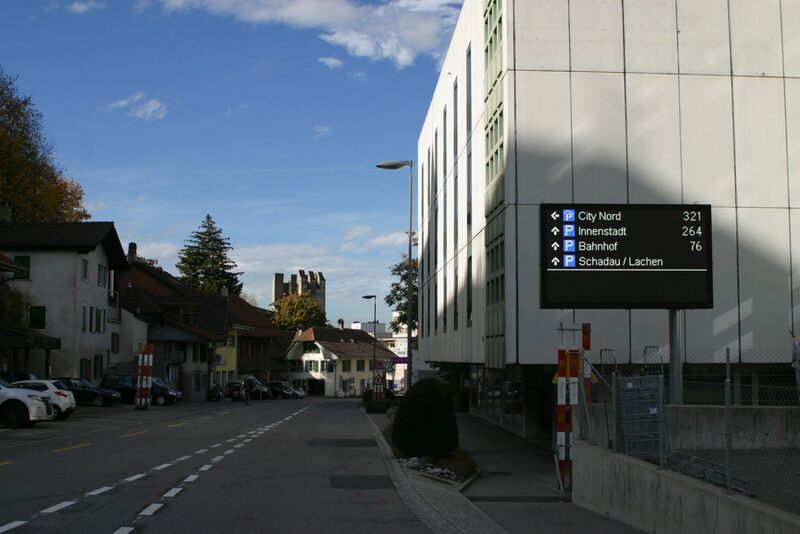 In the first step it serves as a pure parking guidance and information system, in later steps the system will be expanded to a traffic management system for the city of Thun. In order to guarantee this flexibility, all displays are designed as fully graphic and full-colour LED matrix displays. In addition to the parking situation, the displays can also be used to indicate traffic disruptions, events, etc. The data from the existing 7 multi-storey car parks in the city centre as well as 5 further parking facilities are captured by the existing counting devices and fed into the parking control computer via a network interface. In the future, all major parking facilities in and around Thun will be connected to the system. The parking master computer is implemented as a virtual server at the premises of an IT service provider. The system can be operated from any workstation computer in the city of Thun via a user interface implemented in browser technology. Authorisation for this is via user name and password. All displays are fully graphic, full-colour LED matrix displays from SWARCO. The displays thus offer the greatest possible flexibility for changing telematics applications (parking guidance system, traffic information, event displays,...). The displays are controlled by the parking control centre via UMTS telecommunication.